But in February, I visited a shiva home of one of the victims of the school shooting in Parkland. There were pictures up all over the house of the young woman, just 14 years old, whose life was taken. I saw a picture of her when she was just 3 years old in her soccer uniform. There is an old saying about parenthood – the days are long, but the years are short. One day you are changing your child's diaper, the next day, they are entering Kindergarten, and next they are graduating high school, and you wonder where the time went. But for this family, the years of their daughter and sister was cut far too short, a victim of one of the most horrific mass shootings in American history, in a place which should have been a safe haven – her high school classroom. When you hold your baby for the first time, you sort of jump forward in time. You think to yourself, “I wonder what their voice will sound like? What about their personality?” You picture their first day of school as they hold the little signs with their new grade. You picture them at the bimah at their bar or bat mitzvah, at their prom, in front of their computer as they wait to hear what college they got in to; you picture them on their wedding day. I will never forget hearing Rabbi Bradley Shavit Artson talk about his twins. One of them, his son Jacob, was born with severe autism. When he was told by doctors of the severity of Jacob's autism, he recalls one thing in particular. Time suddenly stopped, and all of those visions of the future suddenly vanished. All the milestones he was looking forward to would never happen. Raise your hand if your life is turning out exactly the way you thought it would. If your life followed the trajectory that you expected and there have been no surprises, pleasant or unpleasant along the way. In our minds, we have a reality that we see – it's called option A, although we don't think of it as option A, we think of it as the inevitable future. Sheryl Sandberg, the COO of Facebook, was on vacation with her husband Dave Goldberg. They had two beautiful children at home, and they had a rare opportunity to have a vacation alone. They were sitting in front of a beautiful beach without a care in the world. Her husband decided to go to the gym while Sheryl took a nap. Hours later, he wasn't answering his phone, and after a frantic search, they found her husband, the father of her two children, lying on the floor by an elliptical machine in the resort's gym. They took him to the Emergency Room, and then, just minutes later, she received the news from the doctor: “I'm sorry for your loss.” At the young age of 47, her husband was dead. Weeks after losing her husband, she was talking to a friend about a father-child activity and who would pick her kids up when her husband usually would, and they came up with a plan. At that moment, she broke down in tears, “But I want Dave!” Her friend put his arm around her and said, “Option A is not available. So let's just kick the heck out of Option B.” It became the title of her next book, a follow up from the book, Lean In: Women, Work, and the Will to Lead which made her famous. This was not the sequel she expected. There's a famous Jewish phrase, Man plan, God laughs; we might have a plan in life, but it rarely turns out the way we expect, sometimes for better, and sometimes for worse. There are many people in this room today who are living out their Option B. Maybe it was losing a friend or family member in that now infamous school shooting, or losing relatives to addiction, a powerful disease that so many of our loved ones carry for life, or for many of us, hearing about a family member or friend who was given a diagnosis of cancer. Every year, the path we thought we were going to take for the year changes. Today, I want to share how we can cope with the futures we never expected, and yet, we will experience, whether we like it or not. We do so with our resilience, the God-given ability that helps us to move forward at difficult moments. It gives us the capacity to persevere when it seems utterly impossible to do so. Sheryl Sandberg recognized that resilience was the soil in which the possibility of a future that had been unalterably changed could take root. I believe our tradition and history can teach us how to overcome, to build our resilience, and persevere by building our reservoirs of hope, and taking action. Families are the great training ground for Option B, for it is in our families that we encounter some of our greatest challenges and disappointments – loss, infertility, adultery, divorce, bankruptcy, and betrayal. Perhaps this is why the Torah readings for Rosh Hashanah focus on families who face these challenges and others. Abraham’s whole life is a series of Option B choices, at first his wife Sarah cannot have a baby, then he has a baby with Hagar named Ishmael, and then, after Isaac is miraculously conceived and born, Sarah becomes upset with Hagar and Ishmael - Abraham sends them out into the wilderness. But it's not just Abraham who is living in an Option B world. When Hagar had Ishmael, could she imagine that she would be kicked out of her home and watch helplessly as her son almost dies of thirst? It was at that moment when the angel of God says, “What troubles you, Hagar? Fear not, for God has heeded the cry of the boy b'asher hu sham, where he is. Hold him by the hand – another translation is hold him up in your hand– it's at our most troubling of moments, when we are faced with an uncertain future, that we gain strength and courage when someone else holds us up by taking hold of our hand. We experienced this in the days after the tragedy at Marjory Stoneman Douglas High School. 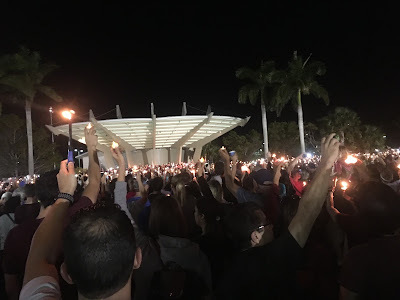 I attended the sunset candlelight vigil that the city of Parkland organized as a response to the shooting at Marjorie Stoneman Douglas High School that took 17 innocent lives, teens and teachers, where scores of others were physically injured, where thousands were and still are emotionally and spiritually scarred. I did not know what to expect, how many people would show up? What would the atmosphere be like? An estimated 10,000 people who attended with little notice. Together we prayed, we sang, we listened to tributes by parents and teens, by politicians and faith leaders, and together, under a dark sky, we lit up the night. That Shabbat at Shaarei Kodesh was one of the most moving Shabbatot I have ever experienced. Our sanctuary was filled to capacity, only seen on happy occasions like a bar or bat mitzvah. People who hadn't come for years came to seek refuge, to hold the hand of the person next to them. In a way, the community was engaging in an act of Tesuvah – literally returning to the center. This is one way we cope with Option B – by taking someone else's hand. It is the most important thing we can do as human beings for one another. The people around us are one of the tools for building resilience. In the Talmud (Berachot 5a), the rabbis were searching for the reason as to why God allowed good people to suffer. They called it - Yisurin Shel Ahava – afflictions of love. It is a problematic theology, but there are ways to look at this phrase in a totally different way: our suffering can bring us to love God more, and in turn, trust in ourselves. It brought me back to a heart breaking confession I heard from one of our teens on the day of the shooting: “Another mass shooting at a school, the 18th school shooting since the new year, and the adults are not going to do a darn thing about it.” This tragedy was different – thoughts and prayers were not enough. When the same tragedy happens over and over again, it can leave one hopeless. Tzipita Li'yeshuah?5 We usually translate this these words as did you have hope in your life, but some translate it as, did you wait for salvation? Tzipita Li'yeshuah? The Talmud chose a strange word – tzipita, which some translate at waiting or yearning, but a more accurate translation might be 'seeing'. Did you see a different future and act upon it? The Talmud imagines that God is not just asking if we desired redemption and salvation, rather, God wants to know, what did you do to bring it about? The Alenu, a prayer that was written just for today, is an aspirational prayer – it dreams of a future where the whole world will be united when the wicked will turn good. We say the words, “L'Taken Olam B'Malchut Shaddai.” In that sentence, you can hear a version of the words, Tikkun Olam, a mending of the world, but it's actually more than that. L'Taken Olam B'Malchut Shaddai, to heal the world to make it suitable for God's presence means that we must lay the groundwork for God through our actions. Rather than the Messiah coming to us, we bring on the Messiah through our deeds, and we may even have a piece of the Messiah in us. Did you 'see' a different future and do something with that vision? This is one of the keys to resilience – to be able to see past your suffering and imagine a different future. The early Zionists were sick of waiting for a Jewish homeland. We waited for 2,000 years, so they tried a different tactic. Theodore Herzl, the father of Zionism, wrote in his diary at the first Zionist Congress in Basle in 1898, “Were I to sum up the Basel Congress in a word — which I shall guard against pronouncing publicly — it would be this: At Basel, I founded the Jewish State. If I said this out loud today, I would be answered by universal laughter. Perhaps in five years, certainly in fifty, everyone will know it.” In 1948, fifty years later, the Jewish state gained her independence, with it's national anthem, HaTikvah, the Hope. Community, faith and hope, and acting in the world helped people suffering in our community build resilience. After Parkland, the students stopped waiting for the adults to do something, and a tight-knit group of friends created one of the largest marches in the history of our country, creating a movement called March For Our Lives. After Parkland, parents have taken action on behalf of their children, one of the victim's mothers ran for the school board a couple of weeks ago, and won. Up until this moment, debate was a nice thing to learn, and now we know why they practiced so much, because the moment was waiting for them. What life saving mitzvah has your name on it that is waiting for us, waiting for you this year? In this New Year, all of us have an opportunity to build our resilience by courageously holding each other's hand in community, by building our faith in God and ourselves through hope, and acting upon it by creating the future that we see as we come out of our darkest moments. When life throws curve balls at us, and it will, and when suddenly Option A isn't available, God give us this charge – take someone else by the hand this year and help them; build your resilience through hope and take action; and let's kick the heck out of Option B.